This crochet hat and cowl pattern is crocheted with the puff stitch and a bit of open lace for a nice lacy but cozy hat and scarf set for the fall or spring weather. I love the bit of lace at the top of the hat, it’s perfect for showing off your crochet talent, especially when you are short like me… because everyone can see the top of your head. The hat pattern is available in two sizes by switching up your yarn as instructed, and the cowl can be crocheted to any length and height that you want. The pattern provides you with two options, but you can easily modify the cowl as needed. Make it an oversized cowl for a cozy hood in the cold winter months, or keep it short and sweet for just a bit of extra warmth in transitional weather. 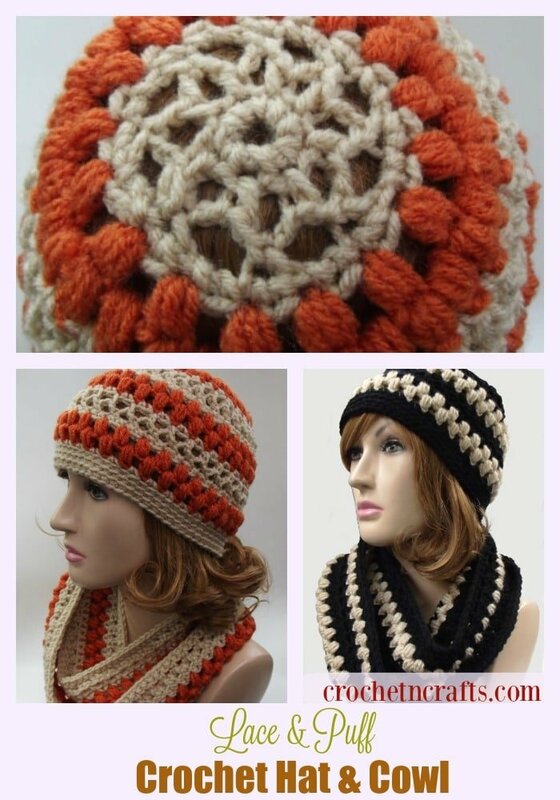 If this crochet hat and cowl set is not what you were looking for, you might be interested in some of the sets you can find on the main category pages for hats and cowls. This is an intermediate pattern; however, it doesn’t take much to master this once you know the basic crochet stitches. To help you work up to this level you might want to check out these beginner crochet patterns. This pattern calls for a medium weight yarn and provides you with two different gauge measurements for two different sizes. I used Red Heart Super Saver for the Smaller size, and Red Heart Comfort for the Larger size. The comfort yarn is a bit thicker than the super saver, but choose any yarn and hook size to obtain gauge needed for desired size. Both yarns are economic, but if you plan on gifting this crochet hat and scarf set, then why not choose a softer and more elegant looking yarn. Crochet Hook: I/9-5.50mm or whichever hook needed to obtain gauge. Cowl: Gauge is not important for the cowl as you can make it any length you want by increasing the beginning chains in multiples of 2. Hat: Small measures 20.25″ in circumference and large measures 22″ in circumference. Cowl: The long and narrow cowl measures 3.5″ high by 25″ long when laying flat and the short one measures 5.5″ high and 12.5″ when laying flat. Puff St: (Yo, insert hk in st indicated, yo and pull through) 3 times, 7 lps on hk. Yo and pull through all 7 lps, ch 1 to secure. When the pattern says (puff st, ch 1) in next st, work the puff stitch as instructed and secure with a chain 1. Then make another chain for a total of two chains. With CA, Ch 4, join with sl st in first ch to form ring. Rnds 13-18: Rep rnds 7-12 once more. Rnd 19: Rep Rnd 7. Rnds 20-22: Working into Bl only, ch 1, sc in first st and in each st around; join with sl st to first sc. (64 sts) FO. Note: Instructions are given for the short and high cowl, special instructions for the long and narrow cowl are given in parenthesis. You can also make a long and high cowl, which is actually what I prefer. See image below pattern. With CA, Ch 80 (160) or any multiple of 2, join with sl st in first ch to form ring. For the higher cowl rep rnds 2-7 once, then rep rnds 2-4 once. FO. For the narrow cowl rep rnds 2-4 once. FO. Hi Friend — thank you for such a wonderful hat and scarf pattern. It’ll gogreat with my daughter’s coat quite nicely.